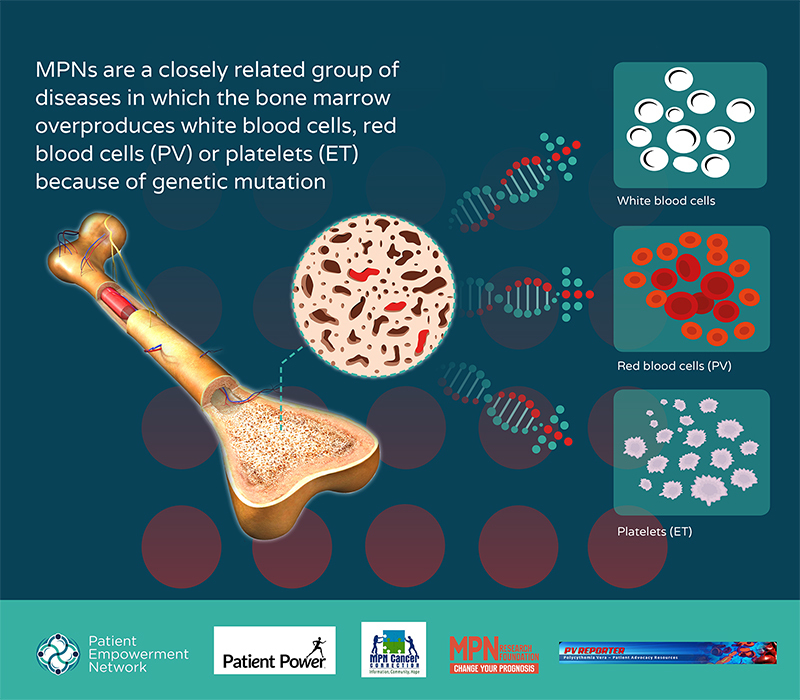 Myeloproliferative neoplasms (MPNs) are a closely related group of progressive blood cancers in which the bone marrow typically overproduces one of the mature blood elements. Other shared features include tendencies toward blood clotting/bleeding, organ enlargement, bone marrow scarring (fibrosis) and a possibility of transformation. 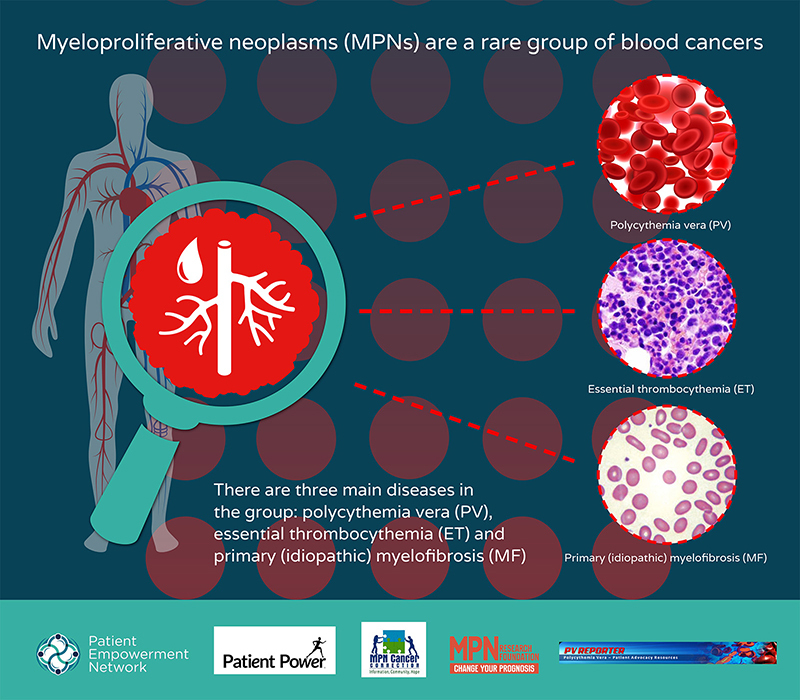 There are three blood cancer types that are categorized as “classic” MPNs: Primary Myelofibrosis (MF), Essential Thrombocythemia (ET) and Polycythemia Vera (PV). The expert panel featured renowned MPN specialist and researcher Dr. Ruben Mesa and was joined by other experienced clinicians and patients on the broadcast, to share knowledge and advice about the benefits of a healthy lifestyle when dealing with myeloproliferative neoplasms (MPNs). 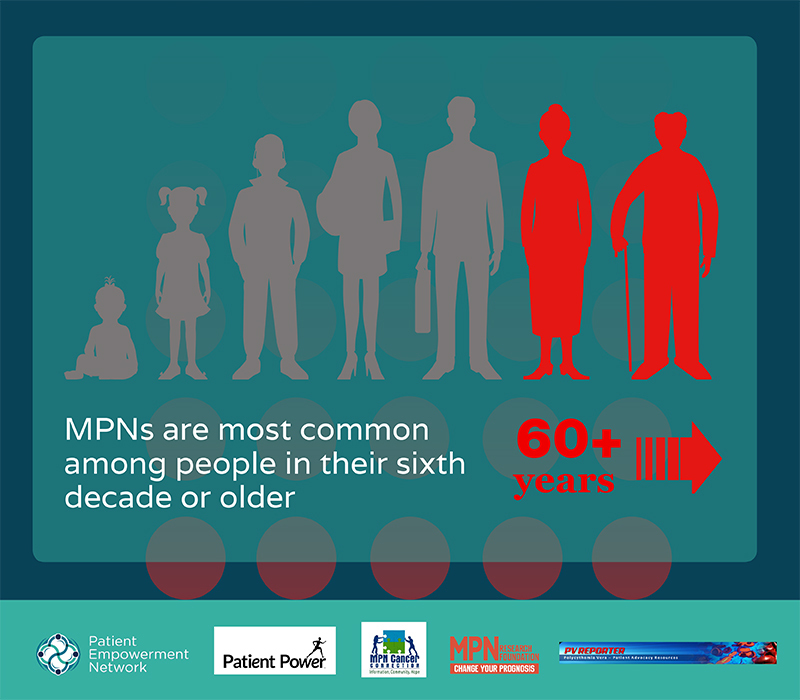 An audience of MPN patients and their caregivers joined us online or on the phone as experts discussed what patients can do to advance research and to raise awareness for MPNs. What new treatments are in development for myeloproliferative neoplasms (MPNs)? What are the considerations when choosing a treatment plan? In this LIVE webinar, Dr. Bart Scott from Seattle Cancer Care Alliance and Dr. David Snyder from City of Hope will help viewers to understand the various treatment options for those living with polycythemia vera (PV), essential thrombocythemia (ET) and myelofibrosis (MF). Should you get a genetic test? JAK2, MPL, CALR, ASXL1: Mutations associated with myeloproliferative neoplasms (MPNs) can bring up lots of questions. What do they mean, and how do they impact your disease? The goal of this webinar, featuring Dr. Alison Moliterno from Johns Hopkins School of Medicine and Dr. Stephen Oh from Washington University School of Medicine, is to help patients understand genetic mutations. 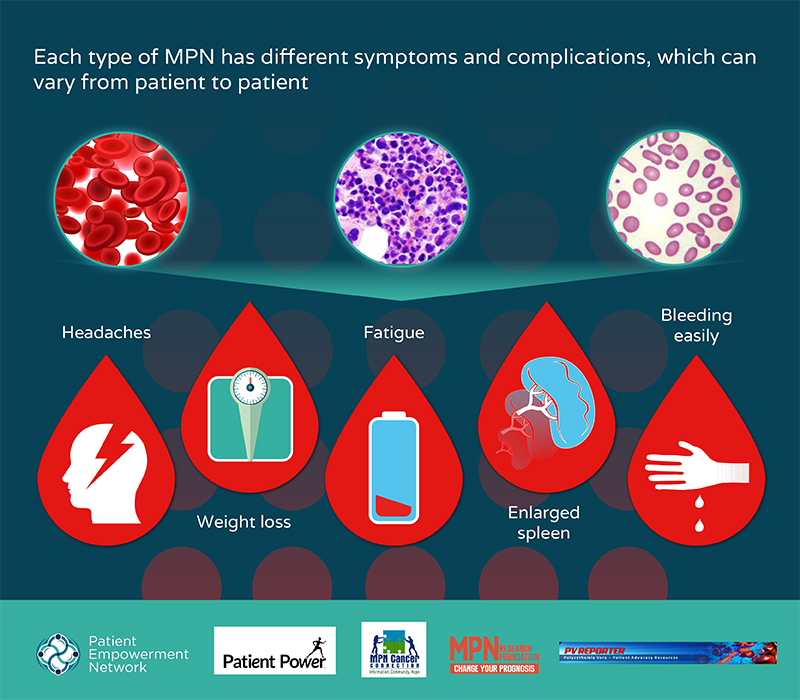 In this “Living Well With MPNs” webinar, our expert panel featuring Dr. Laura Michaelis from the Medical College of Wisconsin, nurse Erin Blackwell from Levine Cancer Institute, as well as patient advocate Beth Probert, discussed managing life with a myeloproliferative neoplasm (MPN). The panel shared advice for finding a specialist, making informed decisions about treatment and monitoring progress of the disease through testing and check-ups. Tune-in now to hear tips for living well from the perspective of patients and healthcare providers. What Can Help Fight Fatigue With MPNs? Cancer Diagnosis - How and Who Do You Tell? 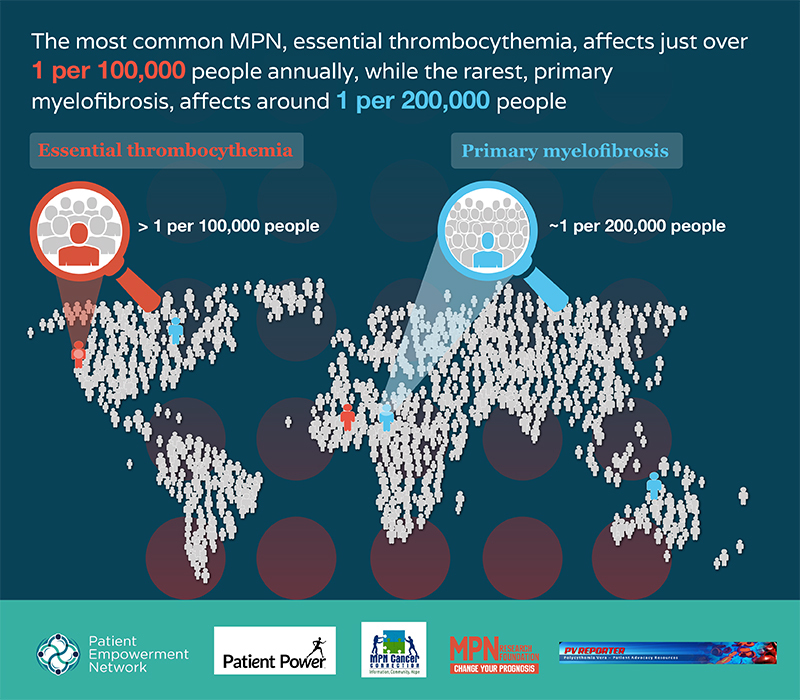 Getting A MPN Specialist's Opinion? Research is ever improving for Polycythemia Vera. Dr. Verstovsek, Dr. Heaney and Bob Rosen all agree that the future looks positive for PV patients. A discussion follows about current and future treatment options. Dr. Verstovsek and Dr. Heaney explain that patient education and doctor/patient communication is crucial for good patient outcomes. Dr. Heaney explains what exactly PV is and what the progression of the disease is. Dr. Verstovsek explains the symptoms of the disease and why they occur. Patient Advocate, Vocille "Peppe" Fryou, shares her cancer journey. Even with 10 years without a diagnosis and several clinical trials, Peppe has persevered and has high hopes for the future. Dr. Laura C Michaelis discusses some of the ways to use social media for you healthcare and its benefits. In an exclusive interview at the American Society of Hematology meeting, Dr. Naveen Pemmaraju talks about results of the phase 3 COMFORT - II trial for myelofibrosis comparing the use of a JAK inhibitor, ruxolitinib, to standard care. Dr. Pemmaraju then mentions another trial evaluating the use of Pacritinib, a new, not yet FDA approved JAK inhibitor that also showed promising results. In closing, Dr. Pemmaraju encourages patients with MPNs to talk with their doctor about clinical trials as a viable treatment option. Dr. Ruben Mesa of the Mayo Clinic, Dr. Naveen Pemmaraju from MD Anderson, Dr. Allison Moliterno from Johns Hopkins School of Medicine and Heidi Cascarano, MPN patient and advocate discuss what was presented at ASCO 2015 in the field of MPNs and what it means for patients.